My sister in law has been facing health testing with my one year old nephew (not cancer, but things just as scary). She asked me yesterday how I made it through the hard times with Jonah. How did I not lose my mind? I gave her some answers, quick & off the top of my head. However, since she asked me, I really started to evaluate what were the things that got me through those times. I thought I should share them with you too. Please feel free to comment with what has helped you through these times with your child. 1. My Faith – Thankfully, I had a foundation of who God is. Well meaning people will misquote the verse, “God won’t give you more than you can handle.” (Misquoted from 1 Corinthians 10:13). Trials and hardships are not the context of that verse. He is speaking of temptation. God won’t give you temptation greater than what you can overcome. However, when scripture talks about trials read 2 Corinthians 1:8-9. When we are given more than we can handle, those times lead us to rely on God. I had to rely on God’s strength, not my own. Here are some practical ways my faith held me up…First, I prayed. I prayed alone, I prayed with my husband, I prayed with my family, I prayed with my church family… We prayed for Jonah’s health, for God’s will not our own, for Jeremy and I, for the doctors, for our family, for other children fighting… I cried out to God, who personally understands the feelings of a parent witnessing the suffering of their child. We tried to take it one day at a time, being anxious for nothing but taking everything in prayer to God who loves us. We tried not to worry about what the future might hold. If you know scripture, you can probably recognize that I stayed in His Word for comfort. Meditating on and memorizing scriptures that reminded me of God’s promises. Jeremiah 29:11 was the verse we prayed over Jonah. “For I know the plans I have for you, declares the Lord, plans to prosper you, not to harm you, plans to give you a hope and a future.” We held on to the promise that God had a good and perfect plan for Jonah. Lastly, I continuously played comforting & encouraging music. Some of my favorites are Bring the Rain by Mercy Me. The singer of MM, Bart, wrote this song when his child was diagnosed with diabetes. Another is Casting Crowns, Praise You in the Storm. I praised God for my blessings even in the hardest times. I just found out that they wrote this when they had a friend who had a daughter dying of cancer. Bebo Norman’s song I Will Lift My Eyes reminded me that God is bigger than all the trials in this world. He is stronger than me and I can rely on him. He is my comfort. Currently, I like Held by Natalie Grant, There Will Be a Day by Jeremy Camp, and Sovereign Over Us by Aaron Keyes. God is sovereign over health, sickness and even death. There will be a day when there is no more sorrow and no more tears and God’s Word doesn’t say we won’t suffer, but he does promise that we will be held. (You can click on the links to listen to the songs on YouTube. 2. My Husband – Most of us have heard the statistic that says 80% of marriages won’t survive a serious illness or death of a child. This was one of my first thoughts that ran through my head when Jonah was diagnosed. “Will Jonah survive? Will my marriage survive? How are we going to make it through this?” With God all things are possible. God is bigger than statistics. Jeremy and I found strength in one another. Jeremy really stepped up and to a hard role in our family. Along with God, Jeremy was the rock in our family. He displayed wisdom when revealing to Jonah that he was facing amputation. He was comforting to me when I felt I was going to fall apart. It seemed that when I was struggling, he was strong and when he was struggling, I was able to be strong for him. He is a man who is faithful to pray for our family. He put his family before his job and spent just as much time in the hospital as I did. God was always faithful to provide the finances that he didn’t earn while helping care for Jonah. We continued to go on dates, we prayed together, we relied on one another instead of letting the chaos of cancer treatment separate us. I can’t imagine having to go through the battle without Jeremy. 3. Support – Sadly we didn’t have much support from others who had been though what we were going through. When I searched online for other families facing amputation from Osteosarcoma, I found owners of dogs who had Osteo…not helpful. We met a few families while admitted in the hospital, and those relationships were so valuable that I wanted to make sure this kind of support was more available to future families. It has been an honor to have the opportunity to reach out to families. We did have support from those around us who love us; our family, our church family, and friends. Accept the support and ask for help when you need it! When people ask if they can help, let them! If they aren’t asking, I would bet that they want to but don’t know what to do. People get busy, but that doesn’t mean they don’t care. Don’t feel guilt over accepting or asking for a fundraiser, a meal, childcare… People around you know that you are going through a hard time, and want to help, but a lot of times don’t know what you need. This is something that I wish I had done more of when going through Jonah’s battle. Let people relieve the small things so you can focus on your child and your family. Through OK Family Network, I have resources, I have people and organizations lined up to help financially, with yard work, with childcare & more, but unfortunately a lot of times these go unused because I don’t know which family needs what services. I can ask, but there are so many families that I’m afraid people who have needs are falling through the cracks because I can only be in one place at a time. I am only an email, phone call, or text away from all of you and I want to provide whatever it is that will help you! Lastly on support, surround yourself with encouraging people, people of hope and wisdom. People who lift you up, not people who feed your fears. There is a balance of reality and hope that I had to find. I couldn’t let myself focus on the terrors of what could be. I tried to focus on blessings. However, when I had bad days, I had to rely on others to remind me of the blessings. Not only do we have to rely on support but we have the challenging job of supporting our child who is sick and also the siblings witnessing everything. Our approach was to keep things positive, with a little bit of reality. I relate how we approached those hard times with the movie “Life is Beautiful”, which is about a father and his son who were in a concentration camp. The father protected his son from the harsh realities of the situation they were in. Jonah of course experienced things no child ever should, however most of his memories are of good things…snack cart, craft cart, video games, visitors, gifts, watching cable, and time with Mama & Daddy. Some of you have heard this story, but when he was scheduled to have an out patient surgery last year, he was disappointed that he wasn’t going to get to stay at the hospital! Then in recovery after his surgery, Jonah’s pain was hard to control and the nurse quietly said “I think we are going to have to admit him.” Jonah’s response through his tears of pain was a soft “Yay”. Again, there is a difficult balance to be found. You must find a balance between letting your child feel the pain they are in and helping them cope with that in an accepting way, but there is a point that we must protect our children from the despair that can take over. We can not forget siblings. Our two other kids were very young, so I realize their needs vary from older kids. Judah was 2 and Joanna was only 2 weeks old when Jonah was diagnosed. While Joanna didn’t know what was going on, we tried to let Judah stay involved as much as possible. We got Judah’s PJs on at the hospital when Jonah did. We let Judah help Jonah open gifts from visitors. We signed Judah up for care package programs for siblings so that he had exciting surprises sometimes too. When he had to stay with grandparents we approached it as “You get to stay with Nana & Papa!”, an exciting opportunity, not a “have to” situation. 4. Myself – I took time for myself. I attended Bible studies, had an occasional massage, manicure or pedicure. (Don’t let $ be an excuse…I have resources!) I went to lunch with girlfriends or dinner with my husband. It is hard to do things like this without guilt. It is hard to do these things without letting cancer take over our conversations. Again, a balance must be found. Allow yourself to feel and be comforted, but also allow yourself to escape. Allow yourself to feel joy. You will be a better parent if you are taking care of yourself; mentally, emotionally, & physically. These are some of the things that I know helped me through the hardest time in our lives. God is good. 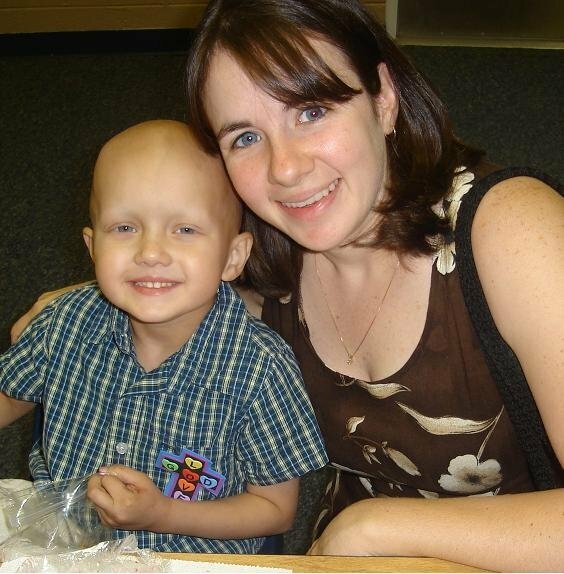 I don’t know why kids get cancer…I don’t know why my son had cancer or why he had to have his leg amputated. What I do know is that God can use what is meant for evil for His good. I know one thing for sure, I have been blessed to meet the people I have because Jonah had cancer…the doctors, the nurses, the kids and the families. My life would not be the same without you all. I love you guys! Please share what has been helpful to you so that we can encourage one another!